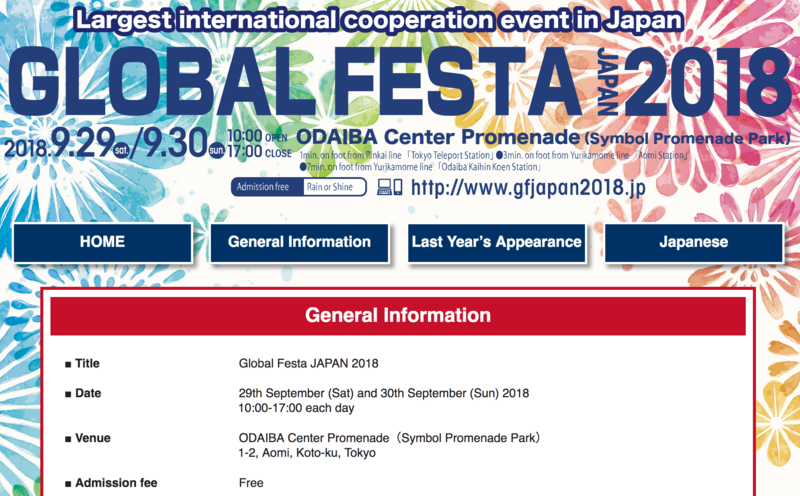 Something called “Global Festa Japan 2018” will be held on September 29th and 30th at the Odaiba Center Promenade in Tokyo. There will be films from the UNHCR 13th Annual Refugee Film Festival, a charity run, “talk shows” concerning various environmental issues, photo exhibits, musical performances, among many interesting and enjoyable events. NGOs representing numerous causes and issues will gather there, so it is an excellent chance for students who wish to take part in internships with domestic or international NGOs to see what’s available. Who knows…you might become inspired to change the world! WHERE: At Odaiba Center Promenade in Tokyo. This entry was posted in Outside Events and tagged film, NGO, NPO. Bookmark the permalink.